And the first half term is over! Time has flown since September. 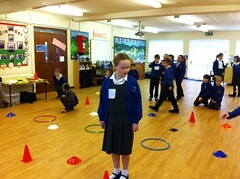 My last school of the half term was back In Tondu Primary with the year 3 and 4 pupils. We had great fun navigating TechnoWall-E around the maze and seeing him using his colour sensor to detect different colours. The pupils were very enthusiastic about robotics and shared their ideas on what they thought would be their ideal robot! We definitely saw some potential robotic experts of the future! We hope everyone enjoys their half term – TechnoWall-E is spending the week charging his batteries ready for a very busy, but extremely exciting November!